The creators of the upcoming video game that pits United States law enforcement agents against a Mexican drug cartel deny that they are ripping their subject from today's headlines. It's a hard position to understand, given that Call of Juarez: The Cartel is set in modern times, casting its bad guys as a vile Mexican drug cartel, while at this moment, in the real world, Mexican drug violence has claimed more than 30,000 lives in the past half decade, according to Mexican government statistics. "We are creating a fictional action movie game," Błażej Krakowiak, one of the game's creators at Polish gaming studio Techland told me as he was showing me the game in Boston at PAX East. "We are not trying to remake real life. We are playing cops, trying to take down a drug cartel." 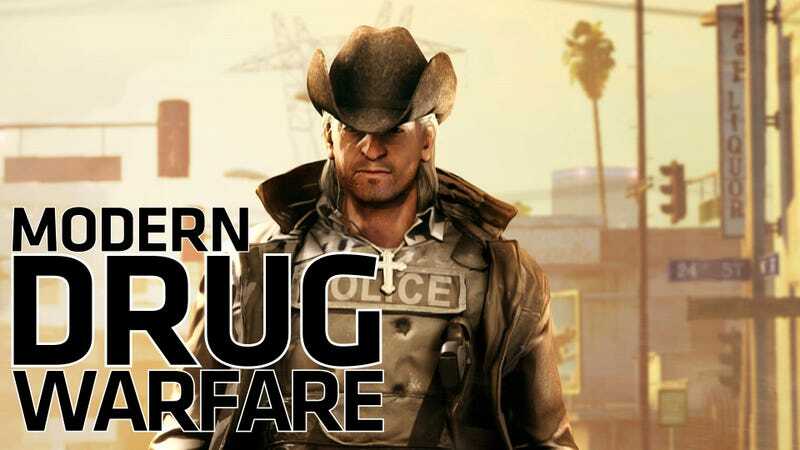 Since the game was revealed in February, its creators and publisher Ubisoft have been verbally attacked by officials in the Texas and Mexico for creating a work that they claim glorifies the drug trade. Those officials hadn't seen the game, which won't be released until the summer. The Cartel is making it's first U.S. appearance this weekend in Boston, where Krakowiak and Ubisoft producer Samuel Jacques played it for me on the showfloor of the PAX East gaming convention. I saw slivers of the game, not enough to make much more of an informed decision about cultural tact than those incensed officials, but enough to understand the structure of the game, its tone and what's special about how it plays. The game is a tale of grimy cops going up against grimier villains. Krakowiak classifies it as a western, a label more easily placed on the horses-and-cowboys previous Call of Juarez games than this cars-and-cops new one. The adventure in The Cartel, he told me, will highlight signature elements of westerns: a sense of lawlessness, the grandeur of open spaces and the dominance of the gunslinger. Krakowiak promises a "dark, mature story." It will be told in the form of a first-person shooter. There are three heroes, Kim, Eddie and Ben, one apiece from the FBI, the Drug Enforcement Agency and the Los Angeles Police Department, called together by the United States Department of Justice to make one last try to eliminate a Mexican drug gang as pressure swells among hawkish politicians for a larger U.S. intervention into Mexico. The three heroes, classified by Krakowiak as an unlikely team who don't get along can be controlled by up to three players co-operatively through a series of bullet-filled adventures. In one section that I saw, Ben, Eddie and Kim sauntered into a Los Angeles nightclub, looking for a drug cartel leader named Jesus. Past the strippers whose breasts and crotches were pixelated for the benefit of the PAX East audience, the heroes found the drug leader and his pack of cronies, gangsters who were more than willing to shoot the whole place up. As nightclub dancers cowered, our heroes were able to shoot down dozens of henchmen. The game uses a "deep cover" system that lets a player tag a spot on the wall where they want their character and an ally to take position, which flows into the "concentration mode" slow motion effect as the characters kick into the next room and gun down enemies who temporarily are moving as if they are underwater. The shootout led to a car chase on a highway, one player behind the wheel, another one or two, if they've joined, shooting. In a later scene, Ben, a man prone to darkly misquoting or misappropriating Bible verses as he kills a guy with his handgun, is ambushed out in desert. That leaves the player controlling him in bad shape, while any player controlling Kim or Eddie get to lean over a ridge far away and snipe at Ben's captors. Krakowiak noted that this desert was one of the wider spaces he was talking about. He seemed excited that he could use that terrain to separate the lead characters across the map, crafting more interesting scenarios. As the bad guys converged, Krakowiak explained that, just as the revolver was king in the old West, the handgun is supposed to feel great in The Cartel, working well in close quarters and proving easy to aim. Judged with my eyes, as I didn't get to control it with my hands, the game feels squalid, its heroes the kind of bleak cops popular in cyncial action movies, the twang of justice sounded as they scowl through their gunfights. The game's villains who I saw in just these two scenes, appear to be cartoon fodder, footsoldier gangstas with little more personality than a cardboard gun target. The signature element of today's Mexican drug war is the toll it has taken on terrorized Mexican civilians. A game that echoes it would show the same, but the only citizens I saw under durress in the slivers of Call of Juarez shown at PAX East were Americans ducking for cover in a L.A. night club. I didn't see what the game makes of modern Mexico. Krakowiak told me that he believes any topic is relevant for video games and reminded me that other eras of violent history whose inclusion in video games has been less controversial were unpleasant as well. "World War II was not a nice time," he said. As we talked about the connections between the game and what's going on in Mexico now — "nothing at all," he said — he protested that The Cartel's concept had been in development for years. It naturally extended a series and, though he did not say this, it's easy to imagine that, before the success of Rockstar's Red Dead Redemption last year, Ubisoft and Techland may have felt that their own western series, never a chart-topper, might benefit from a more modern setting. The game may well not have anything to say about the Mexican drug war because it may be nothing more than a cops-and-robbers fantasy as devoid of civilian pain as most shooting games. It could be, for better or worse, a meaningless escapade. We'll have to see more to better judge that. For now, its creators have a game to trickle out to the press and the full array of verbal defenses to make of their work, calibrated to the critics who often sound off from outside the gaming world. "I don't think we are glorifying violence and saying, 'Go out and shoot people,'" Jacques, the Ubisoft producer who had been controlling the Call of Juarez demo said as we were wrapping up. "We're not doing anything that isn't done in movies."